JASLO: a town and powiat* seat, watered from the north by the Jasiolka and from the west by the Debowka, into which the Ropa flows, so that from that point on these three rivers are called the Wisloka. Jaslo lies in a beautiful valley, 233 meters above sea level, at 39º8' longitude east from Ferro [Translator's note: by today's standard measurement that is 21º28' longitude] and 49º45' latitude north, 57 km. from Tarnow. Highways lead from Jaslo to Dukla, Gorka, and Pilzno. Of the 2,962 inhabitants, 2,448 are Roman Catholic, 22 Greek Catholic, 8 non-Catholic [presumably Protestant], and 468 Jewish. This small but well-built town has single-story brick houses in the marketplace, and wooden courts in the streets, for the most part with beautiful gardens. The surface area of the town covers 815 morga's*, 1,090 sq. sazen's*. The town's assets come to 176,000 zl. (Austrian currency), liabilities come to 7,976 zl., and the annual income is 18,000 zl. Jaslo is the seat of an Imperial and Royal* starostwo* and affiliated offices, a county council, a district school board, an Imperial and Royal county court, and postal and telegraph offices. In Jaslo there are male and female 4-class community schools and an Imperial and Royal academy, founded as a municipal institution in 1868 and transferred in 1875 to governmental administration, which has 350 students. Financial institutions here include a branch of the Galician Credit Society, a savings bank established in 1868 by the gmina* with guaranteed funds of 12,000 zl. (Austrian currency), and a loan fund for craftsmen and industrialists, founded by the gmina council in 1866 for the purpose of assisting craftsmen with 4% loans of up to 1,000 zl. Humanitarian institutions include a dormitory for poor grammar-school youths, an invalid's fund created in 1851 with initial capital of 1,300 zl., a fund for the needy created in 1844, and a general hospital, founded with voluntary contributions between 1838 and 1842. 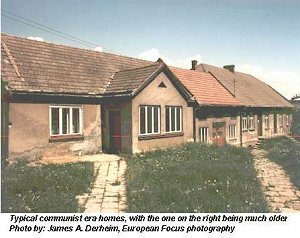 The hospitals goal is to treat and care for the sick at a charge of 60 cents a day; its property consists of a one-story brick house, valued at 18,000 zl., and a garden. Revenues in 1879 came to 13,656 zl. (Austrian currency). The town has the appearance of a completely new one, despite the ancient parish church, and a small number of inhabitants, and all its institutions date from recent timeseven though we have knowledge of this locality as early as 1328because of the numerous disasters that have befallen it. In that year we find a church in "Jassel" in Zrecin deanery, Krakow diocese, on a list of rectories drawn up for collecting Peter's Pence*. Kazimierz the Great incorporated "Jaszyel" with a Magdeburg* charter 38 years later, making it a town, bestowing on it scales and 2 lans* free of fees for pasture-land, commonly called the skotnica [hard to translate, something like "cattle place"] (1366). The Hungarians supposedly destroyed the original church, and according to Dlugosz (in Liber beneficiorum Dioecesis cracoviensis) the current brick one was erected in 1446 by the brothers Stanislaw Cielatko (Czelanthco), doctor of decretals, Sandomierz scholastic, and Mikolaj of Ciolek arms, who is mentioned in 1442 among the canons of Przemysl. On the vault are the coats of arms Janina, Gryf, Pobog, Traby, and Strzemie, from which one might conclude that these and other noble families contributed to its construction. It was about then that Jaslos misfortunes began. During the dispute over Bohemia between Wladyslaw Jagiellonczyk and Matthias I Corvinus [aka Mátyás Hunyadi, King of Hungary 1458-1490], in which Kazimierz Jagiellonczyk took his son's side, the King of Hungary attacked the foothills of the Carpathians and burned Jaslo in 1474. To what extent and how swiftly the town recovered from this attack we cannot ascertain, for the town is not mentioned again until 1550, when it was changed to a starostwo (not affiliated with a grod*) and given to Joachim Lubomirski, a courtier of Zygmunt August, at which point the king confirmed all charters and liberties conferred on the city by his predecessors. An inspection in 1564 does not list how many lan's the inhabitants possessed, but says, "In all, they pay 4 grzywna's*, 28 grosz'es*, 6 denar's*; on houses both inhabited and empty they each pay one grosz threshold tax, 20 gr. per lodging, and on the baths 8 grzywnas. Butchers give 5 grz. for tallow, 2 gr. each for tripe from butcher-stalls, whereas they all contribute toward a good calf. Bakers have 14 stalls, on each of which they pay 10 gr., and cobblers 12 gr. each on the same number of stalls." Judging by the number of bakers and cobblers, one must conclude that the town was significantly larger then than today. Less flattering is the image of the inhabitants' state of sobriety at the time, for "on account of the great drunkenness and resultant killings and other excesses" the holder of the office of starosta* saw himself forced to prohibit the distilling and selling of liquor. The city paid a market fee of 3 marks, and from the census and milling 210 marks, 40 gr., 6 den. It seems that that the making of saltpeter was very widespread, for Zygmunt III forbade making it here, under punishment of a 100-grzywna fine, due to the destruction of forests; at the same time Jews were forbidden to settle in Jaslo and open businesses there. In 1613 Zygmunt III conferred the office of Jaslo starosta on Mikolaj Strus, "who has never failed to take part in any military expedition" [part of the starosta's duty was to participate in any military action the King undertook], and in 1619 he renewed it and strengthened the prohibition against Jews, "because they hinder the townsmen in trade and buy up all the victuals." Despite such royal protection, the town fell in Jan Kazimierzs time, during the war with Sweden; it was occupied and burned, probably in 1655, by the Swedes. Royal inspectors in 1664 found there "only one house of hospitality [presumably an inn], 5 taverns, and 10 common houses, all other places lay empty"
They paid 10 florins coronation tax. A butcher showed a charter from 1574 allowing only eight to stay in town and establishing that they were all to pay a total of 15 grzywna from their stalls for tallow. Naturally at this time the town was not able to provide for the levy en masse a war carriage with good horses and a cannon, as it was obligated to do. It is doubtful whether the town recovered from this decline, for again in 1683 it experienced a terrible fire, which happened again in 1755 and 1826. The next-to-last starosta of Jaslo, Adam Tarlo (took office in 1733), was an ardent supporter of Stanislaw Leszczynski; the last starosta was Jedrzej Moszczenski, Inowloclaw [sic] voivode, who in 1772 paid a kwarta* of 6,018 zl., 25 gr., 12 den. Belonging to the starosta's jurisdiction were the villages of Krajowice, Kaczorowy, Bryszczki, Hankowka, and Siemiechow. Jaslo was an open town, and the starosta resided in a castle in Krajowice, 5.6 km. from Jaslo, and the castle there was not attacked. It is surely to these ruins that Balinski refers in Starozytna polska, for there is no tradition of castle ruins in Jaslo. Besides the parish church, there was in Jaslo a church and monastery of the Carmelites; when they were founded is unknown, but it was probably before 1437. 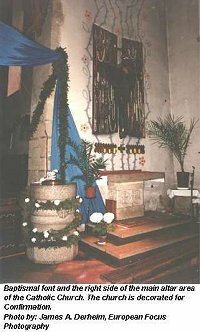 There was a well in the chapel, which St. Wojciech is supposed to have blessed while on his way from Hungary, and a miraculous image of the Blessed Mother, called "Hungarian," which is currently to be found in the village of Tarnowiec, "to which so great a number of pilgrims came from Poland and especially from Hungary, that the town had no room for them all." Emperor Josef II abolished the monastery in 1786 and changed it into an office for the starosta. 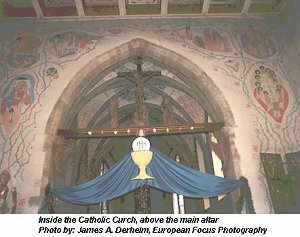 The records mention also a benefice of the Visitation of the Blessed Mother, which Zygmunt I established in 1550, and a hospital of the Holy Spirit with a chapel. 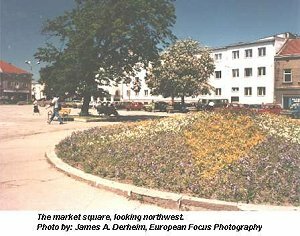 Today there is no trace of that famous well, but the people point to a spring along the road to Tarnow, maintaining that it flows from Dukla "from St. Jan" [surely a reference to Blessed Jan of Dukla] and is helpful with eye ailments. Surely this is the form the tradition of an ancient well has changed into. At the cemetery there is a brick chapel dating from 1862 called "The Parish of Christ's Crucifixion," it belongs to Przemysl diocese and includes 21 localities with a total of 7,157 Roman Catholic inhabitants, 7 non-Catholics, and 468 Jews. Jaslo powiat has an area of 9.57820 myriameters, and 83,709 inhabitants in 154 settlements and 150 catastral gmina's. Within its borders are three county courts: in Jaslo, Frysztak, and Zmigrod. Jaslo county borders on Krosno county to the southeast, Gorlice county to the southwest, and Pilzno county to the north, so it covers the upper river-basin of the Wisloka and the foothills of the Beskids. In terms of population and soil fertility of Galician counties, this one must be considered among the second rank. The northern part of the county is more fertile, namely the delightful valleys adorned with beautiful and numerous manors of the nobility, whereas the northern part [sic  presumably the author meant to say the southern part] is less fertile and therefore less heavily forested. In this part of the county, in Lezyny near Zmigród, there are numerous oil wells. Strzyzow, has a delightful Gothic-style church; its inhabitants are potters. The smaller towns are Debowiec, Jedlincze, and Jodlowo, which has declined a great deal. The more important villages are: Binarowa, Czarnorzeki, Dobrzechow, Gleboka, Glogolow, Jaworze, Kobylanka, Korczyna, Kroscienko, Kunowa, Libusza, Moderowka, Nawsie, Nieglowice, Odrzykon, Polany, Raclawice, Ropa, Rosenbark, Rychwald, Samokleski, Sobniow, Suchodol, Szymbark, Tarnowiec, Trzciana, Trzenica, Turaszowka, Wysowa, Zarnowiec and a colony of Germans in Wiesendorf. Czarnorzeki stands out because of its delightful surroundings, Gleboka has mineral waters, and many people make pilgrimages to Kobylanka. In Koscieniec Swedish prisoners of war settled down as colonists. Kunow is the clan nest of the Oswiecimskis. Libusza is a village known from the end of the 14th century. Nawsie has a mineral spring, in 1840 a factory making nankeen and katun [?]. In Nieglowice one can see the ruins of an ancient castle. Odrzykon has a mineral spring, ruins of a castle on a cliff from the 12th century, called Ehrenberg. Polany has a glassworks. In Samokleski is a nice palace. The last of the Firlej clan died in Sobniow. Suchodol originated as a settlement of Swedish prisoners of war. Szymbark is known from the 12th century under the name of Schonpark, Rakoczy destroyed its ancient castle. Tarnowiec is a well known site for pilgrimages. In Trzciana there is a chapel at the spot where Blessed Jan of Dukla stayed. In Turaszowka there is a hot mineral spring, and there is also a mineral spring in Wysowa. In Zarnowiec lived Adelajda, the daughter of a Hessian landgrave, deserted by her husband, Kazimierz the Great. Read Hibel, "Bruchstucke einer Topographie des Jasloer Kreises, geschrieben im Jahre 1808" ["Sketches of a topography of Jaslo county, written in 1808"] in Vaterländische Blätter für Österreich, 1811, no. 76. The same item in Polish is in Dod. do Gaz. lwow., 1811, no. 43.  There is a short description of the town and a drawing in Steczynskis Okolice Galicyi, no. 1.  "Z podrozy archeologicznej w Jasielskim," Czas, 1852, no. 235."Spostrzezenia meteorologiczne w J." in Jahrbücher der Central-Anstalt f. Meteorologie, v. Kreil, Wien, 1860, VII, 140.On iron ore in Jaslo county see Jahrbuch der geol. Reichsan., Wien, VII, 836; on oil there see ibid., XV, 184."Przyczynek do flory obwodów jasielskiego i sanockiego p. Knappa" in Spraw. kom. fizyogr., Krakow, 1869."Jaslo i jego okolice" in Tygodnik Ilustrowany, Warszawa, 1879.Acta oppidi Jaslien. ab anno 1584 ad 1643, manuscript in the Bibl. Ossolin., no. 432.  Mac.